The windhorse amulet brings success luck and triumph in all your endeavours. 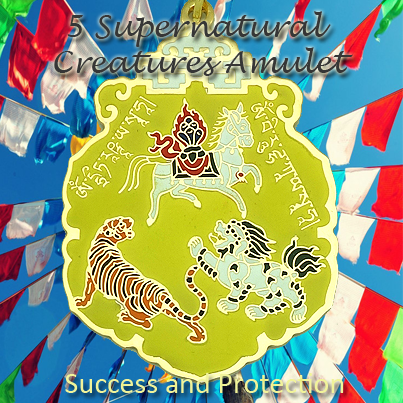 Anyone looking to start a new business, leapfrog to a higher position in your career, launching a new product line, embarking on a new endeavour or starting a new college year will benefit from carrying this amulet. Apart from that, those whose zodiac forecast or personal 8 Characters chart showing vulnerability to danger, burglary, misfortune or financial loss in the upcoming year will require this protective amulet. Some afflictions, pesky stars and evil spirits tend to bring a host of problems big and small such as misfortune, financial loss, hostility, accident, treachery, duplicity, untrustworthy friends, disaster, danger, ghostly encounter, injuries, violence, mysterious sickness and black magic. These unseen forces only fear the Cosmic Protectors and Enlightened Beings. 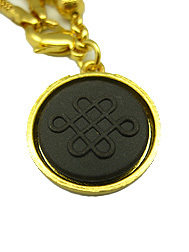 Feng Shui practitioners are often armed with this kind of amulet to ward off all odds, misfortune, devastation from unlucky stars and annual afflictions (especially from Violence Star #7).
" om drita rashta ya soha"
" om biru dhaka ya soha"
" om biru paksha ya soha"
" om beshra manha ya soha"
The windhorse (rlung-rta) is the heavenly representation of the horse. It is originated from Tibetan culture and later embedded into Tibetan Buddhism. In Buddhism, its element belongs to the "wind". Unlike the theories of Five Elements in Feng Shui, "wind" is considered as an element by itself. It is known as windhorse due to its ability to gallop in the winds and break the stillness to ride rapidly across all the directions to the heaven. It provides the energy to the wind and brings positive feng shui to our spaces rapidly and inexhaustibly. It symbolizes the mobility and speed of teh cakravatin. It is the ultimate symbol of accomplishment and achievement in life. It has the ability to fulfill our wishes because it carries them to the heaven and obtain blessing for us from deities and protectors to bring good fortune and remove obstacles. In connection with the abandonements of the Buddha, the windhorse is depicted wearing golden and precious ornaments as a symbol of Buddha's faith horse Kanthaka, who died of a broken heart when his master renounced his kingdom. The Tibetan astrological system names 4 categories of personal vitality: 1. Life Energy 2. Health 3. Personal Power 4. Succcess. The windhorse actually is a connotation of these categories combined together to form a positive energy that eliminates hindrances caused by illness, misfortune, demonic and planetary influences. The energy of the wind should never be underestimated because it channels psychic energies of the body which the mind can ride. A puja can invoke the windhorse on the mornings of waxing moon. 1. In your home, business premises, important rooms or office. Displayed at elevated areas will allow you to ride through the victorious winds of nobility with less obstacles. 2. By the bed to bless the particular individual. 3. In the family hall to channel positive luck for the whole family, with good health, love luck, prosperity and smooth career. 4. At your work desk to ensure your work is always recognized by your bosses and your goals are always met. It ensures that your talents and hard work is acknowledge by the right people. 5. In the south to gain good reputation and public fame.